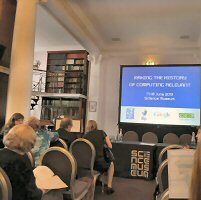 Earlier this week I attended a conference on the history of computing held at the Science Museum in London. The conference was entitled Making the History of Computing Relevant and was organised by the International Federation for Information Processing (IFIP) in conjunction with the Science Museum and the Computer Conservation Society. This was the first event of its kind to be held in the UK for several years and attracted participants from all over the country plus a large contingent of overseas visitors from as far afield as Australia, Japan and Hawaii. The main theme of the conference was exploring what could be done to make the history of computing relevant and interesting to the general public. The programme featured 28 presentations spread over 2 days. These were structured into a number of sub-themes, each of which included a generous allocation of time for questions and discussion. Dr Lean’s presentation featured video and audio clips of interviews with some of the pioneers of computing in the UK which he has been gathering as part of the British Library’s ‘Voices of Science’ oral history project. Listening to these fascinating clips gave the subject matter a more human dimension which should certainly help in making the history of computing more compelling to a non-technical audience. Dr Zuse’s presentation was a hilarious account of his efforts to build a replica of the legendary Z3 electromechanical computer developed by his father in 1941. It included clips from a video diary Dr Zuse had kept on the project, featuring such comic scenes as DHL couriers struggling to deliver heavy boxes containing thousands of electromagnetic relays to Dr Zuse’s top floor flat. It was by far the funniest conference presentation I have ever had the pleasure of witnessing. A reception was held in the Science Museum’s Alan Turing exhibition on the evening of Day 1. This only added to the general air of conviviality and shared enthusiasm for the subject which permeated the whole event, although there was one moment of heated debate on Day 2 regarding whether museums should make more of an effort to give working demonstrations of their exhibits in situations where the equipment is still in working order. I was also struck by the number of septuagenarian delegates sporting the latest smartphones, tablets and laptops and who were clearly much more skilled at using them than I am. Proof perhaps of the adage “once a computer geek, always a computer geek“? I am indebted to Google for sponsoring the conference, without which I probably could not have afforded to attend, as the delegate fees for conferences of this quality are usually several hundred pounds. 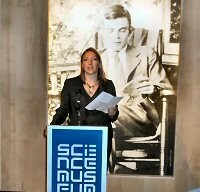 Thanks also to Dr Tilly Blyth (pictured above) and her team from the Science Museum for organising such an enjoyable and well run event. Hopefully, the programme committee will decide to make this a regular event. I’m already looking forward to attending the next one! This entry was posted in Uncategorized and tagged Computer Conservation Society, Konrad Zuse, Science Museum on 21/06/2013 by Stephen J Marshall.